Dakota’s favorite activity is her Arctic animal matching. Now that she’s mastered exact object to picture matching, here I introduced similar object to picture matching. As you can see the figurine isn’t a perfect match to the animal photo. You can read more on this type of language work in my previous blog post on language learning. The arctic animals are a Safari Ltd TOOB set and I purchased these arctic animal photo cards for $1 from Teachers Pay Teachers. (To print, I scaled each photo flash card down to 30%, printed on cardstock, and laminated.) Dakota not only matches the animals to these photo cards but also likes to bring them over to her winter animal books to find matches. TOOB animals have so many uses! Another Antarctic-themed activity we’ve incorporated at home is our snow sensory play. I filled our sensory bin with white kinetic sand, snowflake confetti, and large penguin figurines. She loves to scoop the “snow” with her hands or small spoons, fill her wooden molds, and move the penguins around the bin. (Unfortunately I do not have link to wooden molds - they have been discontinued on Amazon.) If you haven’t tried kinetic sand before, it’s such a great sensory experience for toddlers, lasts a long time, and is easy to clean up. I would avoid using this around carpet though! Lastly, we of course relied heavily on books for this theme, and winter season in general. She and I have started going to the local library every other week which has definitely helped us with our winter collection! Below you’ll see a list of our favorites. 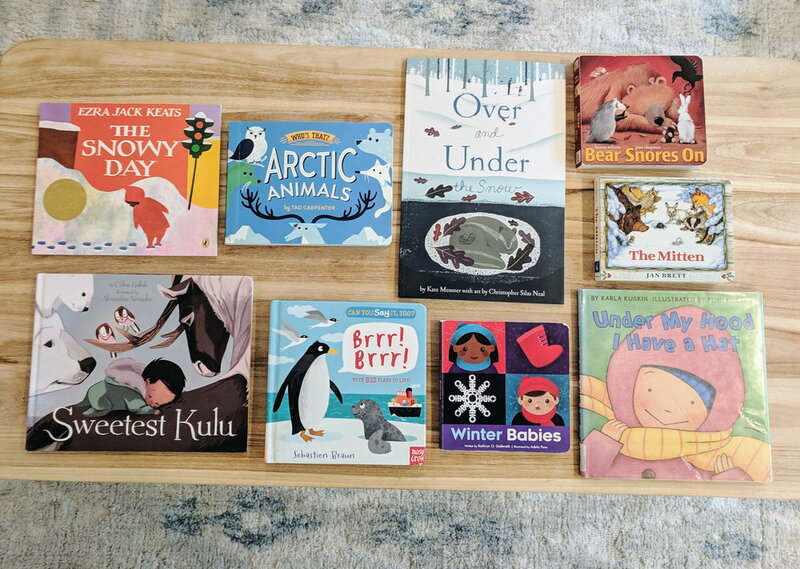 Dakota has been very excited to move onto some larger and lengthier books, though we save the library and hardback books for reading together, and board books for her baskets and shelves. Arctic Animals by Tad Carpenter - a fun guessing game of who’s hiding, and a few fun facts about each animal! The Mitten by Jan Brett - another classic that probably doesn’t need explaining! Brrr! Brr! by Sebastien Braun - another lift the flap board book, with animal noises! Under my Hood I Have a Hat by Karla Kuskin - perfect for discussing the many layers we wear when we step outside in wintertime!